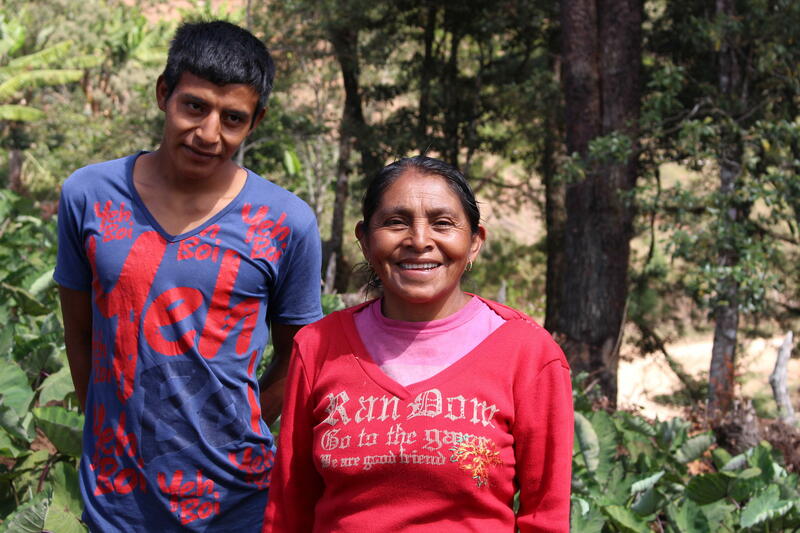 Candida Lopez Garcia and her son Alberto in their garden. First world countries like the United States have developed infrastructures, strong economies and reliable agricultural systems allowing its citizens to consume what they want, when they want. UPR’s agricultural reporter Bronson Teichert traveled to Honduras to speak with farmers about what it costs them to supply the U.S. with commodities like coffee all year round. The ideal conditions for coffee beans to thrive are found around the world along the equatorial zone called “The Bean Belt,” located between the latitudes 25 degrees North and 30 degrees South. Farmers in Honduras harvest coffee from October to February, so about four to five months. While we are drinking coffee year-round, how do the farmers who grow the beans pay the bills or have enough money to buy food for the rest of the year? Candida Lopez Garcia and her two sons Pedro and Alberto grow coffee in Opatoro, an area close to the coffee cooperative in Marcala I’ve talked about in earlier stories. When I visited the Garcia farm, the oldest son Pedro was harvesting coffee beans at a field at another location. Their small, cement house and storage sheds were on top of one of the many mountains in the southeast region of Honduras. It wasn’t like a typical farm in the United States, nestled in a valley with level land. The family garden was on uneven ground which can be difficult to grow food while retaining water and soil. Alberto and his mother are working with a non-governmental organization called International Development Enterprises or iDE. Local representatives train farmers like the Garcia family to install drip irrigation systems and follows up on all the installations. The Garcia family learned to grow living barriers to retain water and soil. Their crops grow on steps that rise and fall with the naturally uneven ground. At the edge of each step, plants with wide leaves create a fence to stop erosion. Now, this family of farmers can better preserve the land and grow food. Better food and extra money after the coffee harvest are simple but important factors keeping Candida and her family in Honduras. Living conditions high in the mountains of central America are not easy, but being surrounded by highly demanded coffee and living in the upper watershed is easier than people who live in lower elevations. Jose Luis is an agriculture climate smart facilitator for iDE. He knows the many of the people iDE works with along with the programs helping them improve their lives. He said access to water changes everything. Jose Luis said conservation in the upper watershed by farmers like the Garcia family impact people in the lower watershed. He is seeing improvements in the lives of farmers around Opatoro, but wants farmers in lower elevations to have opportunities like Candida. One of their main customers are local schools. Before, children were eating corn, beans and rice for lunch. Now the schools are buying fruits and vegetables from local producers to improve the diets of children. The Garcia family is growing diverse crops for themselves and enough to make a profit and experiment with sources of protein. Chickens, are common in Honduras but now the Garcia family can afford better breeds of chickens and a safe place to keep them. Fish, or tilapia in this case, are not so common in the mountains of Honduras. Having this extra source of protein with more varieties of crops is a huge improvement in their diets and their lives. Next time in my series about agriculture in Honduras, I’m going to dive deeper into the water issues Hondurans are facing and how water is impacting immigration to the U.S. This story is part two of a feature series about agriculture in Honduras. If you didn’t hear part one, we heard UPR’s agriculture reporter Bronson Teichert talk about how much money Honduran farmers make growing coffee and how they are becoming more efficient business owners. For part two of this story, Bronson tells us about the strict process that coffee beans go through after harvesting to even make it out of the country and how it impacts individuals in the coffee industry. In the United States, most people enjoy the luxury of going to the grocery store or a restaurant and not breaking the bank. The Bureau of Labor Statistics reported the average American makes around $850 a week. That means we get to spend that money on things like coffee grown in Honduras.